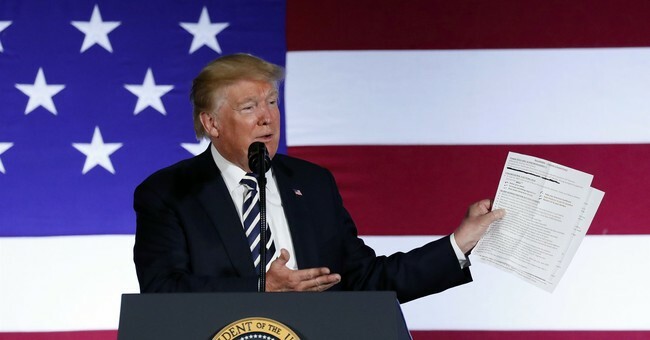 After months of requests, President Trump declassified a number of FISA court documents late Monday afternoon and directed the relevant government agencies to release them to the public. "At the request of a number of committees of Congress, and for reasons of transparency, the President has directed the Office of the Director of National Intelligence and the Department of Justice (including the FBI) to provide for the immediate declassification of the following materials: (1) pages 10-12 and 17-34 of the June 2017 application to the FISA court in the matter of Carter W. Page; (2) all FBI reports of interviews with Bruce G. Ohr prepared in connection with the Russia investigation; and (3) all FBI reports of interviews prepared in connection with all Carter Page FISA applications," White House Press Secretary Sarah Sanders released in a statement. President Trump also ordered the unredacted release of all text messages related to the Russia investigation from fired FBI Director James Comey, fired Deputy FBI Director Andrew McCabe, fired FBI agent Peter Strzok and FBI lawyer Lisa Page. "In addition, President Donald J. Trump has directed the Department of Justice (including the FBI) to publicly release all text messages relating to the Russia investigation, without redaction, of James Comey, Andrew McCabe, Peter Strzok, Lisa Page, and Bruce Ohr," the statement continues. On Sunday House Intelligence Committee Chairman Devin Nunes, who has been requesting President Trump declassify these documents for months, argued the documents needed to be declassified before the2018 midterm elections. Nunes also announced he would be declassifying a number of depositions by key players in the Russia probe.